The Amarnath Yatra showcases the perfect symbol of bonding and unity among the people cutting across religious lines. The market at the yatra base camp is run by local muslims. 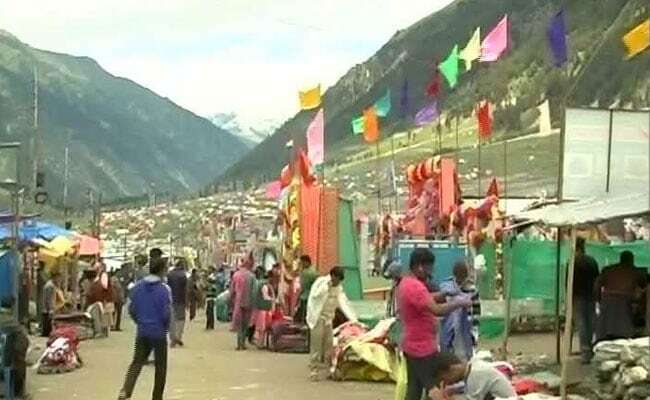 Srinagar: For many Kashmiri Muslims like Zain ud Abidin, in northern Jammu and Kashmir, the annual Amarnath Yatra pilgrimage undertaken by Hindus is a keenly awaited event. Though Mr Abidin sells walking sticks to the pilgrims at Baltal, it is not always the business that yatris bring that he looks forward to. "The yatris encounter snow mud and slippery tracks, the sticks are very useful for them, this is particularly helpful for children and old people", said Zain ud Abidin. It is serving the pilgrims that gives him a sense of satisfaction, he said. The Amarnath Yatra showcases the perfect symbol of bonding and unity among the people cutting across religious lines. The pilgrimage is incomplete without the support of local residents who set up stalls on the route and make arrangements to welcome the pilgrims. Nand Lal, a pilgrim, who is making his 19th trip to Amarnath agrees with Mr Abidin. "He sells the sticks and pilgrims buy them. These things make yatra very comfortable for us," said Mr Lal. Locals have always been part of the Amarnath Yatra arrangements. The cave houses an ice stalagmite structure believed to symbolize the mythical powers of Lord Shiva. The structure waxes and wanes corresponding to the visible moon. In fact, it was a Kashmiri Muslim family that discovered the cave more than 150 years ago. The locals were also instrumental in relief and rescue operations in 1996 when a snow storm killed 200 on the yatra route. The market at the yatra base camp is run by local Muslims who have set up hundreds of stalls for the pilgrims. "This yatra is impossible without the help of locals. Those who can't go on the ponies can take the services of palkis (palanquin) that are run by the locals. Locals make all the arrangements," said Sundar Sharma, pilgrim.